It isn't Europe's most beautiful city or its oldest. Its architecture is not more impressive than that of Rome or Paris; its museums do not hold more treasures than those in Barcelona or London. 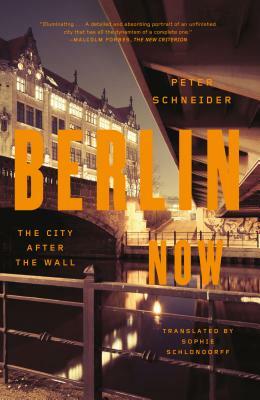 And yet, "when natives of New York, Tel Aviv, or Rome ask me where I'm from and I allude to Berlin," writes Peter Schneider, "their eyes instantly light up." Berlin Now is a longtime Berliner's bright, bold, and digressive exploration of the heterogeneous allure of this vibrant city. Delving beneath the obvious answers—Berlin's club scene, bolstered by the lack of a mandatory closing time; the artistic communities that thrive due to the relatively low cost of living—Schneider takes us on an insider's tour of this rapidly metamorphosing metropolis, where high-class soirees are held at construction sites and enterprising individuals often accomplish more, and without public funding (assembling, for example, a makeshift club on the banks of the Spree River), than Berlin's officials do. Schneider's perceptive, witty investigations of everything from the insidious legacy of suspicion instilled by the East German secret police to the clashing attitudes toward work, food, and love held by former East and West Berliners have been sharply translated by Sophie Schlondorff. The result is a book so lively that readers will want to jump on a plane—just as soon as they've finished their adventures on the page. Peter Schneider is one of Germany's best-known political essayists, the author of The Wall Jumper and the novel Couplings. He lives in Berlin.